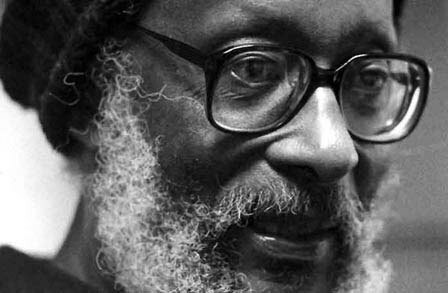 Kamau Brathwaite was born Lawson Edward Brathwaite in Bridgetown, Barbados on May 11, 1930. For his secondary education, Brathwaite studied at Harrison College in Bridgetown, winning the Barbados Island Scholarship in 1949 to attend Cambridge University, where he studied English and History. He received a B.A. with honors from Pembroke College at Cambridge in 1953. In 1954 he received a Diploma of Education from the same institution, and moved to Ghana, where he worked as Education Officer for the Ministry of Education. In 1960 he married Doris Monica Wellcome, a Guyanese graduate in Home Economics and Tropical Nutrition from the University of Leicester. During his years in Ghana Brathwaite began writing, first plays, Four Plays for Primary Schools (1964) and Odale’s Choice (1967), the later play premiering in a Ghana secondary school before being performed in the nation’s capital, Accra. In 1962 Brathwaite became Resident Tutor in the Department of Extra-Mural Studies in St. Lucia, and in 1963 joined the History Department of the University of West Indies in Kingston, Jamaica. In 1966 the poet began the organization of the Caribbean Artists Movement, from London, serving as the co-founder and secretary of the organization, CAM. His focus on Caribbean studies has produced numerous academic studies of great importance throughout his life, including Folk Culture of the Slaves in Jamaica (1970), The Development of Creole Society in Jamaica, 1770-1820 (1971), Contradictory Omens: Cultural Diversity and Integration in the Caribbean (1974), Our Ancestral Heritage: A Bibliography of the Roots of Culture in the English-speaking Caribbean (1976), History of the Voice: The Development of Nation Language in Anglophone Caribbean Poetry (1984), and other such works. Among his many works of poetry are, Rights of Passage (1967), Masks (1968), and Islands (1969), collected as The Arrivants: A New World Trilogy in 1973. Since then he has written numerous works poetry, winning the Griffin Poetry Prize for his Born to Slow Horses in 2005. Brathwaite has won numerous other awards, including Guggenheim and Fulbright Fellowships, the 1994 Neustadt International Prize for Literature, the Bussa Award, and the Casa de las Améicas Prize for Poetry. Today the poet divides his time between New York City and Barbados.